Do you have a place to go in case of an apocalyptic disaster? Most of us don’t. Now what if I told you that for a $1,000 a year, you could have a bug out location that is built to withstand doomsday, loaded with plenty of supplies, and populated by dozens of survival experts? It might sound too good to be true, but I assure you it is, and it’s called Fortitude Ranch. I hadn’t heard of this survival community until a few weeks ago when I saw a Fox News segment featuring the ranch and its founder. The more I listened to the retired colonel speak, the more intrigued I became. I immediately started researching Fortitude Ranch in great detail. I’ve written about and toured multiple prepper compounds and survival communities in the past, and almost always wound up feeling greatly disappointed. Sometimes the disappointment sprang from the lack of sufficient supplies and fortifications at the compound. Other times the disappointment was because the best communities collapsed under their own weight, unable to stay organized. A growing number of survival compounds I have written about were created with millionaires and elite government officials in mind. A shocking number of such compounds, many of which are underground, are popping up throughout the United States. 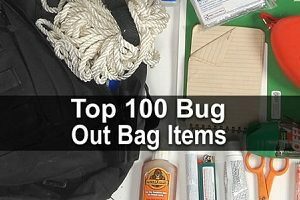 Most of us do not have deep enough pockets to even consider using such a facility for a bug out retreat. I was pleasantly surprised to find that Fortitude Ranch was different from every other survival community I had researched. 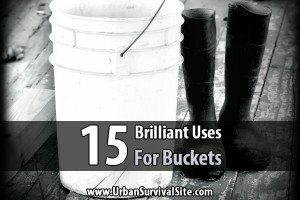 It is basically a larger scale of what my survival tribe and our family are doing on our self-reliant homestead, and it includes the type of skilled medical professionals all preppers would love to have in their mutual assistance groups. Fortitude Ranch was developed with typical Americans, not tycoons, in mind. Unlike many of the survival homesteading retreats being built in strategic locations in the United States, the man behind Fortitude Ranch is not a businessman attempting to capitalize on the 5 million American preppers seeking a place of refuge for their loved ones. Nope, Dr. Drew Miller has long lived a self-reliant lifestyle and is a retired colonel who worked at the Pentagon. Miller is also a retired United States Air Force Reserve Colonel, CMA, CFP, and CM&AA. After some friendly preparedness chit-chat, the retired colonel and I delved into the facts, schematics, locations, costs, operational procedure, amenities, and policies which comprise all of the Fortitude Ranches. You know, the stuff all preppers want to know before investing their money and lives into an extensive new survival community. When our conversation concluded and it was time for me to start writing up a piece about this potentially life-saving community, I decided to deviate from the traditional interview publishing format and create a blended review/interview piece using both the information Dr. Miller told me during our phone conversation and my own research into the ranch. If you live in the city or the suburbs or don’t have ample land and loved ones to prep with, Fortitude Ranch could be your best survival option during (and after) an SHTF disaster. The only thing I found disconcerting about Fortitude Ranch is what appears to be one of the prime motivators for its creation: the potential for a bioengineered pandemic. Now, many folks prep for a lot of different reasons and scenarios, but Miller’s great concern over the likelihood of such a disaster, coupled with his professional background and extensive expertise, have caused my survival tribes to invest more time and money into preparation for a man-made pandemic. After graduating from the Air Force Academy with honors, Miller garnered a scholarship to Harvard where he earned a Masters Degree and Ph.D. in Operations Research and studied underground nuclear defense shelters and field fortifications for troops. He has been researching threats which could cause the collapse of society, especially ones that involve bioengineering. Such man-made disasters would most likely lead to genetically modified viruses that could spark a worldwide pandemic. The Fortitude Ranch CEO graciously granted me an interview to discuss the creation and progress on the first two survival retreats and plans to create at least 12 more. 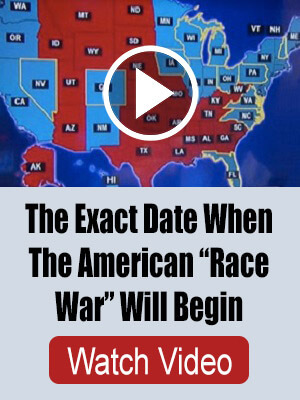 As Dr. Miller noted during our chat, when the SHTF, mass panic will quickly ensue, followed by violent civil unrest. Looting and other lawlessness will turn urban and even many suburban areas into combat zones in a matter of days. I just happened to catch Dr. Miller discussing Fortitude Ranch a few weeks ago on Fox News. I was both intrigued and inspired by the concept of a survival retreat affordable to regular working class people, especially since it was created by experienced preppers who actually know what they’re doing. Dr. Miller worked with a select group of prepping partners to design the Fortitude Ranch concept. Even though you won’t actually live on the ranch until disaster strikes, you can visit any time. There’s a housing unit where you can store your things, and you can spend time with other members for recreational and training purposes. So, What Exactly Is Fortitude Ranch? The ranches are set up to function like a country club, survival community style. Members pay an upfront fee to join a Fortitude Ranch. That fee permits them to use the facilities for vacations, hunting, recreation, and to practice on the shooting range. Fortitude Ranches will all be equipped with medical professionals and a medical clinic, as well as other things necessary to live through a long-term nationwide disaster. All of the ranches will be located in secluded rural areas adjacent to or very near mountainous state or national forests. Members can visit or bug out to their “base” ranch, or any ranch they choose, both now and when the SHTF. The shelters at Fortitude Ranches are simple yet sturdy structures. Dr. Miller said the system of shallow underground bunkers and log homes was successfully tested at the Colorado location and is in full use at the West Virginia ranch. Additional construction of corrugated metal shelters with sleeping quarters and storage spaces is underway. 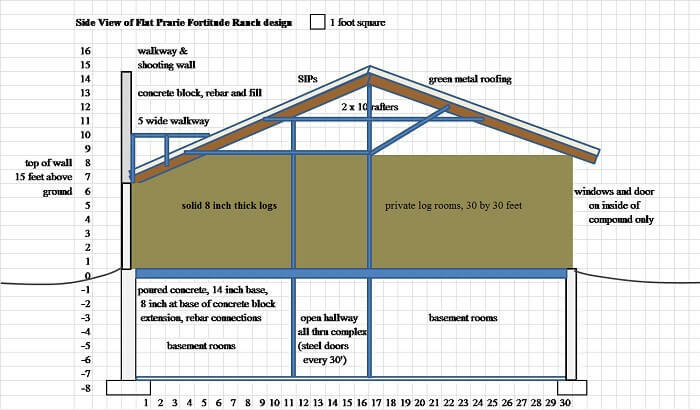 Typical shelter design on the property includes pipes that connect the basements beneath the log homes with composting commodes or waterless toilets. The shelters are unfurnished except for storage shelves that are used as bunk beds. Fortitude Ranch stockpiles foam mattresses for the bed units. The log living spaces include traditional bathroom and kitchen facilities and tables for dining purposes. Shelter designs will vary somewhat by ranch location, but the general design offers 500 square feet of living space. A 10-foot concrete wall with guard posts at each corner will be constantly staffed. Approximately 4 feet of dirt cover the underground metal survival shelters which are accessible via emergency exit hatches. How Do Fortitude Ranches Function? The ranches are all designed with flexible facilities in mind to further their goal of protecting members during a pandemic. If a contagious illness on any level becomes a concern, members can be housed in separate rooms with their own separate air supplies to deter the spread of the virus, including a quarantine room. Fortitude Ranch members can store their weapons and other preps in private storage lockers with their own locks or in their private living spaces. Members of the survival ranch community are also trained to serve as guards alongside trained staff. Because several feet of dirt is necessary to shield a person from radiation, the underground bunkers and basement living spaces are built in shallow areas and easy to reach quickly when an alarm is sounded. The ranches are also working survival homesteads year around. All the ranches have chickens, cattle, and dairy goats. There are also hunting and fishing opportunities to help create a secure food supply inside the survival communities. 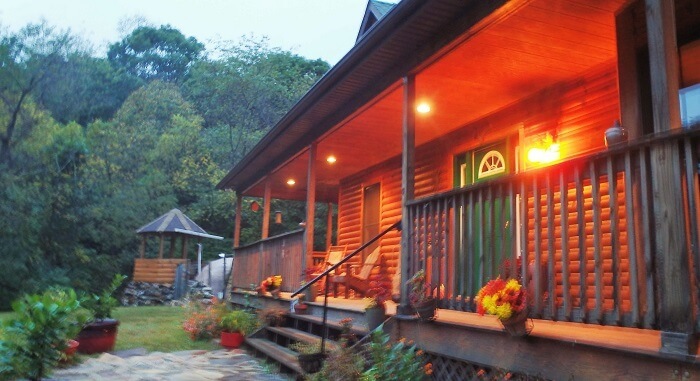 • An on-site log lodge will serve as a community center during an SHTF scenario. • All members will have access to food, shelter, and safety during bad times and recreational opportunities before disaster strikes. 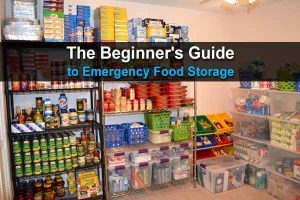 • A one-year stockpile of food is stored on the property. • Gardens, along with the livestock noted above, are maintained on the property to serve as a sustainable source of food. 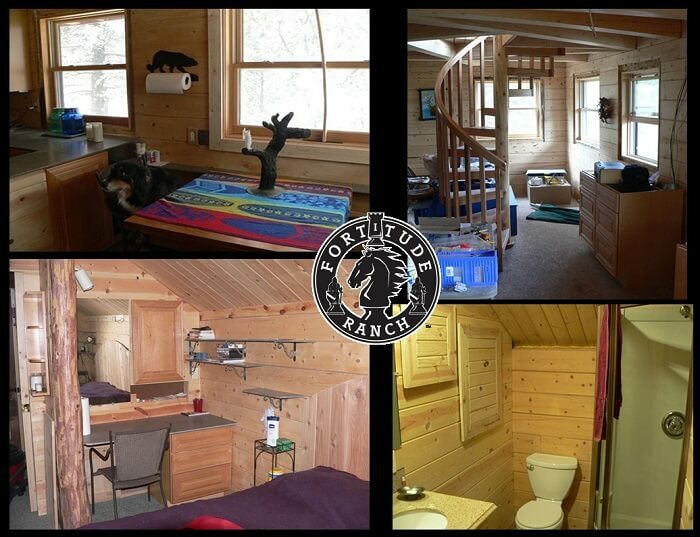 • Both the log lodge and the basement rooms can be used as visitation lodging by members. The metal underground bunkers are used for the storage of preps until they are needed for disaster housing units. • A horse stable is also open to member use on-site. • Water sources on Fortitude Ranches will include creeks, dug wells, as well as stockpiled water. 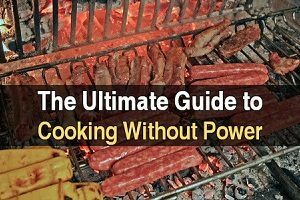 • Wood, propane, methane gas, and coal are among the stockpiled fuel sources at the survival ranches. • Medical supplies are stockpiled at the on-site clinic. • New to prepping and don’t have a gun (or specific type of firearm) or the skills to use it? You can borrow one from the facility to use during on-site shooting range training. • Because some Fortitude Ranch members will be flying to the survival retreat, they will all be located in areas that boast a small airport and/or a landing strip at the ranch. A fleet of planes and aircraft fuel is also planned to be among the member amenities. • During and after a collapse, road travel may not be possible and will almost assuredly be highly dangerous. The Fortitude Ranch planes can be used to transport supplies between the ranches, attempt to reunite family members who are at different ranches, and share news and information. Where Are Fortitude Ranches And Where Will More Be Built? There are currently two Fortitude Ranches, one in West Virginia near Mount Weather and another in Colorado that is still in progress and is planned for structural completion by the end of summer 2018. An open house will be held at the West Virginia Fortitude Ranch location from April 21st to the 23rd. Preppers interested in attending the event can contact Dr. Miller and his team via an email on the Fortitude Ranch website. According to Dr. Miller, the ultimate goal of the ranch operators is to have ranches located about 300 miles from each other (about a 5-hour drive) throughout the country. Where future ranches are located is dictated by member vote. A map on the Fortitude Ranch website shows possible regional locations inside specific states. 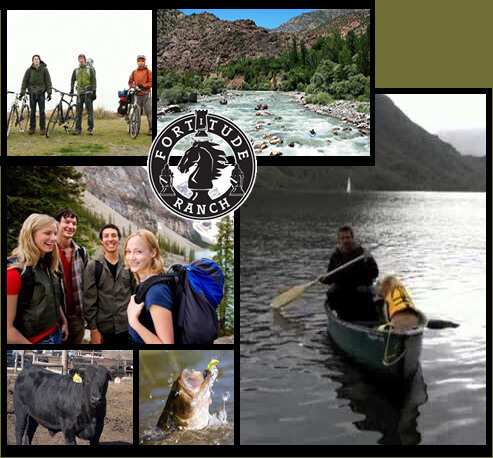 • If you’re a member, no charge is levied to spend the night at a Fortitude Ranch. But, the length of a member’s stay can be dictated by demand to ensure privacy and use of recreational amenities. • The number of days per year a member can stay in the above ground rooms is limited to 7 days during the summer months, 7 days in the winter months, and 4 days during the fall hunting season to ensure all members get a chance to spend time at the ranch. • Priority scheduling is offered to members at their base ranch. Visits to other ranches is on a first come first serve basis. •Non-member guests are allowed on a space-available basis. • Members must pay a fee of $20 an hour for horseback riding. Non-member guests can also use the stable and hit the trails for a higher fee on a space-available basis. • Meals at the lodge are $10 each for members, and open to non-member guests for an additional fee. Dr. Miller and his team definitely want to make it both easy and affordable to find out what Fortitude Ranch is all about. You do not have to make a large payment up front and can use their survival version of BitCoin to essentially hold your place in line while you decided whether or not to apply for membership. A Fortitude is a member coin that you can purchase now at a lower price to avoid paying a far steeper price in the future – perhaps when there is mass panic and everyone finally realizes a TEOTWAWKI event is about to happen. Holders of Fortitudes get first dibs when a membership waitlist forms. When membership hits capacity, a Fortitude Ranch wait list will be created and folks who hold the member coins will be given priority status to join when a spot at an existing ranch becomes available or when a new ranch opens. 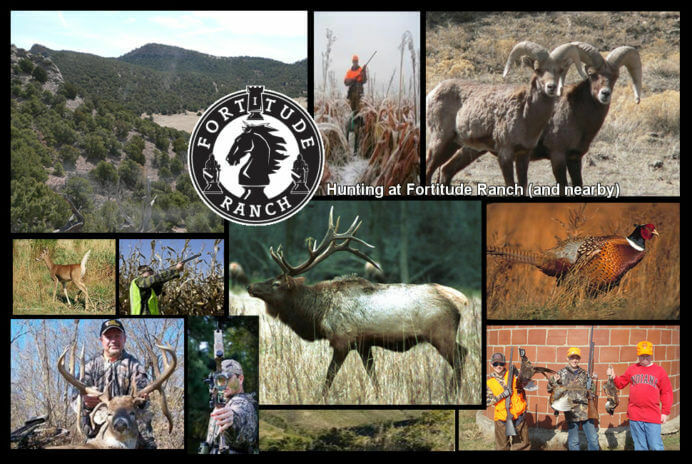 Fortitudes can be purchased from the Fortitude Ranch website via either PayPal or credit card. The ranch can either hold the Fortitudes for the purchaser to apply towards a future membership or transfer them to the buyer’s digital wallet. During the special introductory period, the Fortitudes were sold for $100 each. They are currently being sold for $125 each. I would love for a Fortitude Ranch to open in my neck of the woods, and I told Dr. Miller how much of a perfect fit our region would be – based on location, land attributes and quality, community acceptance, amenities, etc. The low-level of government intrusion into our lives here, no zoning laws or permit office, is really nice. We are one of the few places left where you can buy a piece of land, walk onto it, and start building your home from top to bottom, inside and out, with your own hands any way you want. If I didn’t already have a survival retreat and a large, close-knit tribe to ride out the apocalypse with, I would be whipping out my wallet and securing my spot at a Fortitude Ranch right now. One of the “for millionaires only” luxurious underground prepper retreats is going in the next county over. That’s nice for them, but I would take my current community members or Fortitude Ranch members with actual hands-on skills over the folks who don’t have any real survival skills and can only write a big check. Kudos to Dr. Miller and his team for embarking on a monumental undertaking that will save the lives of our fellow Americans. While speaking with the retired colonel, it was readily clear that Fortitude Ranches are a labor of love for him and so many others. We are all in this together folks, whether we like it or not. The more people who are prepared and have somewhere to go, the fewer violent marauders and desperate people there will be. This sounded somewhat interesting until the end, when you referred to the “retires colonel” as the “general”. Now it all appears to be a sales pitch. No thanks. It’s just a typo. I didn’t receive any compensation for publishing this article. I published it because I found it interesting.